The Under 14 Camogie team started their league with an away game v Clontarf in St. Anne's Park. Our newest member, Victoria, captained the side on her first outing and had a great game. Maurs showed great development in skills and teamwork and won 8-9 to 1-2. The First team also enjoyed a successful launch to their season when they defeated Kilmacud Crokes by 2-17 to 0-13, finding their stride in the second half after trailing by five points at half time. Danny Butterly was their chief assassin, firing 2-3 from play. There were many shining performances, not least in the half back line of Paul McAllister, Kevin Reade and Joe Gleeson. The game also saw a welcome return to the club colours for the Sheridan brothers, Paddy and JM, who both delivered fine displays. Sunday, the 25th of February, marked an historic landmark for St Maur’s when, for the first time, a second adult hurling team entered competition, the occasion decorated with an excellent performance and winning start - the ground-breakers overcame Round Towers of Clondalkin in AHL 7 by 1-17 to 1-9. The emergence of a second adult team underlines how hurling has prospered from humble beginnings in Rush and is a fitting reward for the pioneering work of the likes of Martin Wall who must have been especially proud to see this day arrive. That first team victory earlier on in the day placed a little pressure on the second team to follow suit. They didn’t disappoint. Inspired by Martin Mulvey and Fergal Butterly, they led by four points at half time having playing with the hill and breeze, then found that merciful ‘second wind’ after the interval, having heard some words of encouragement from manager Paul Comiskey. Pooch Lalor scored six points and looked like a man who has been secretly practicing his frees. Cathal Price earned the distinction of becoming the first goalscorer for a Maur’s second adult hurling team, the fruits of an honest and hard-working shift at full forward. Given the long list of injured/unavailable hurlers on Sunday last, as many as 18, the two results were all the more encouraging. We would like to acknowledge the first team players who came out later to volunteer as water-carriers for the seconds match or to help out in other ways. We sincerely thank anyone who came to offer support, those who were there to share with us this unique and special day. St Maurs under 14’s took on O’Tools at home in the first league game of the season on a very cold but bright Sunday afternoon. 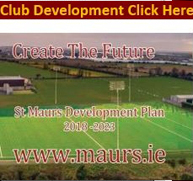 St Maurs took hold of the game from the throw in, launching waves of attacking play from the flanks and winning ball in the middle of the park. At first we missed a few chances but as confidence grew the girls started to score goals from surging runs, and points from further out when they found the channels blocked. At half time our defence had only been beaten once and the game was dominated by our movement and passing. O’Tools made a brief rally in the second half but the St Maurs back line again halted the danger and removed the threat via the flanks feeding a very eager group of attacking players. Overall the hand passing continues to be our great strength with girls looking for the unselfish ball, on attacking runs or recycling play to create a new opportunity. 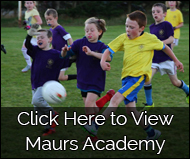 The final result was a Maurs win, 4-10 v 2-1, a great start to the league campaign.